Hotel Ten Eyes are the rare band I wanted to see before I heard any of their music. The band first formed in December, and four months later embarked on their first tour. When I first became aware of them, they were a Nashville based four piece featuring Joe Fletcher and Ron Gallo, who are two of my recent favorites. Once I saw they were playing the ultra tiny Fort Foreclosure in Warren, RI, I knew I had to go. The first thing I noticed when Hotel Ten Eyes took the stage was that Ron Gallo wasn't with them, and they are now a three piece and Ron Gallo wasn't with them. (Their Facebook about section states that the band is "Joe Fletcher + a revolving cast of wandering spirits.") It was a bit disappointing, but I do really enjoy Joe Fletcher so I quickly got over it. For this outing, Hotel Ten Eyes was Fletcher, Scott Pittman (who has played drums with Fletcher in the past), and Annie Dolan on bass. 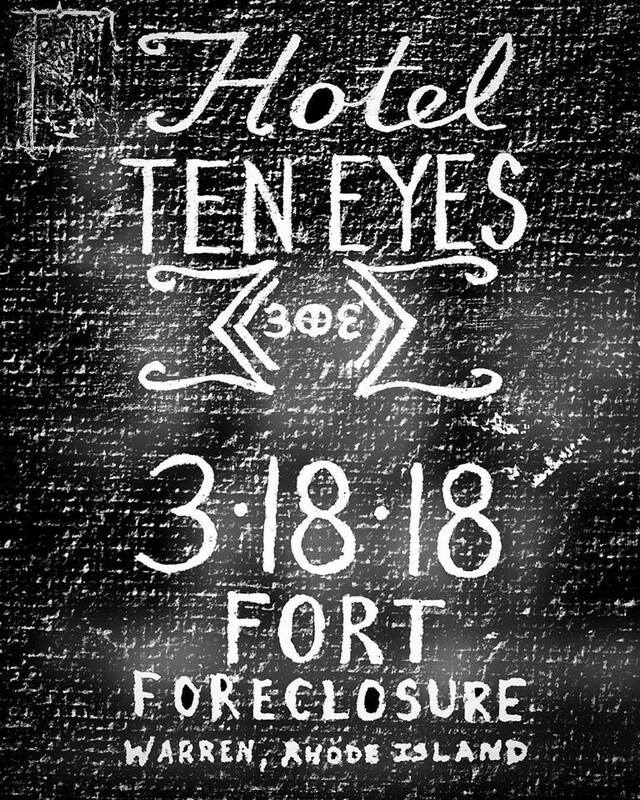 Fletcher made the right call by choosing a side project name for Hotel Ten Eyes as the sound is quite different from his work as a solo artist or as Joe Fletcher & The Wrong Reasons. 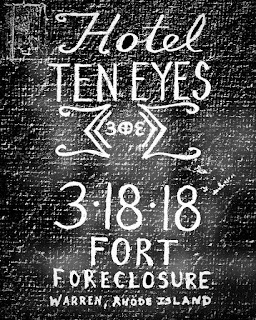 Sure, Fletcher's trademark drawl will always be based in country and blues, and any band with him as the singer is going to sound like him, but Hotel Ten Eyes is much more rock oriented than Americana. They sound like the dirtier side of The Rolling Stones with a more serious Jon Spencer Blues Explosion. For a band that only formed in December with revolving members, they played a tight, but brief, set. Luckily, they weren't too tight and had just the right level of sloppiness to fit the style of music. I first saw Nina Violet, the night's opener, playing with Evan Dando and Willy Mason at my final ever show at TT the Bear's. I quickly adored her unique style of folk-ish music. Even though she's based in MA, her shows away from her native Martha's Vineyard never seem to work out with my schedule, so it's taken me almost three years to see her again. I sincerely hope it's not that long again. Her style of music is slightly off-kilter folk, but her voice adds such a unique element to it. She has that element of being both fragile and powerful at the exact same time. She's one of the more unique artists I've seen that could somehow be fairly huge. A quick word on the venue Fort Foreclosure. It was definitely a... unique place to see a show. It's a tiny storefront filled with artwork that could also be someone's home maybe? The audience was maybe 30 people, and when a venue is also a "collective" or "collaborative," that usually means everyone is incredibly young and I'm guaranteed to be the creepy old guy. Not at Fort Foreclosure. I was somehow one of the youngest people at the show, which hasn't happened since I was 19. It is a BYOB establishment, and they definitely BYOBed. I know millenials and teenagers get the bad rap, but a bunch of 50+ year olds with a drink in one hand and a smart phone in the other are much worse. It's a great, cool, intimate space to see a show, but it has this one quirk I've never experienced before.